Have you thought about adding a roof to your Austin deck? Beautiful details like recessed cans, ceiling fans and rich hardwood ceilings can encompass the interior of your screened or covered porch. Are you tired of the hot Texas sun beating down on you the entire season while trying to enjoy your deck? If so, we have the answer to your woes. We can, in many cases, turn your existing deck into a haven of shade and comfort by adding a roof and making it into an open porch or screened porch. Covered decks are the savvy way to enhance your existing backyard. We will inspect your existing deck to see if it can accommodate the addition of a roof. Often times we can reinforce the foundation enough to support a roof. Open and covered porch transformations are a great way to add beauty and enjoyment to your landscape, and can also function as an outdoor room. Screened porches give you all the benefits of an open porch, but with added protection from the insects. 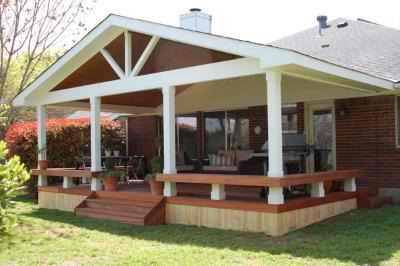 Both structures are a viable option as long as your deck can accommodate the added weight. We can evaluate your existing deck to see if it fits the bill, and can often offer reinforcement to the structural components within your deck to ensure strength and structural compatibility with adding a roof. By adding a roof, your deck will get a whole new look and feel. Your new porch can be equipped with finishing touches such as lighting, ceiling fans, or even an area reserved for that glorious flat screen TV. The beauty of having a screened or open porch design is that is no limit to the interior reveals that can be brought into the mix. 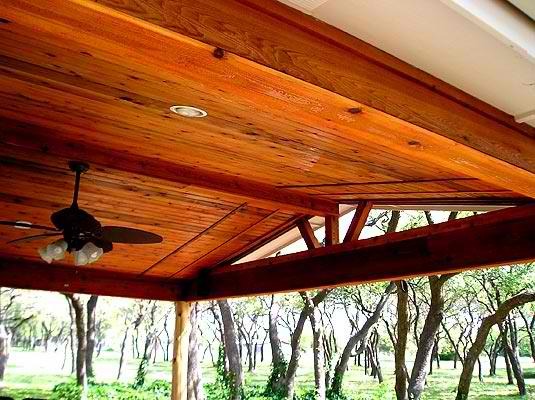 We often use bead board ceilings, rustic beams and recessed lighting in many of our screen porch designs. How ornate or rustic you make your space is all up to you. This entry was posted on April 6, 2012 by austinporchandpatio. It was filed under Covered decks, Covered porches, Screened porches and was tagged with Adding a cover to your Austin deck, Archadeck of Austin, Austin covered decks, Austin covered porches, Austin deck builder, Austin decks, Austin outdoor living transformations, Austin outdoor room, Austin screen porches, Austin screened porches, Austn sun proches.